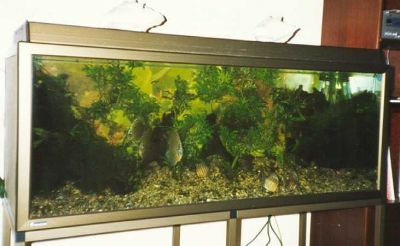 The aquarium was new of the special glazing putty type for aquarium. 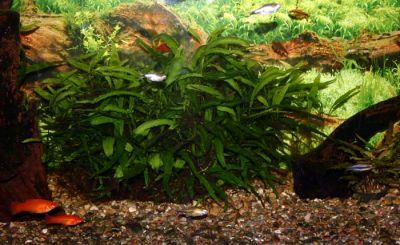 I remember that it was very important in my first year as aquarist to have well planted aquarium. In those years it was mostly small fishes I had in my aquarium and I choice fishes how not destroyed the plants. It was tetra, barbs, small labyrinth fishes and livebearering species. The aquarium was of the special glazing putty type for aquarium. Problem with this type of aquarium was that the putty went hard when old so it was leaking. This was a show aquarium from a aquarium shop and was about 20 years old. I had to take away some rust and painting the framework again. When water testing the aquarium it was still leaking and get help to seal the aquarium. For a long time it was in my room and my father was often sitting there to look on the fishes. In the picture he was reading in a book about the fishes. He like my hobby and was helping me very much in buling aquariums and my two aquarium rooms in those year. He was also a friend of famous Alf J. Næss the owner of Tropica the shop and the his big hatchery for breeding tropical fishes in Trondheim. So I got also very good help in buying new species and selling the fishes I was breeding. 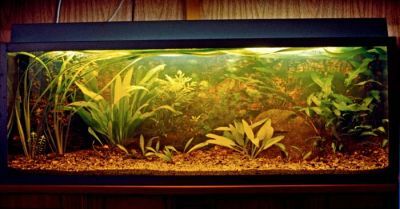 My first silicon glued aquarium from 1973 was 160 liters. 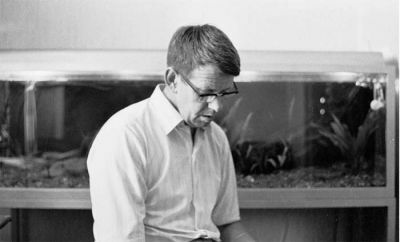 I went to Oslo in spring 1973 and was seeing silicon glued aquarium for the first time. This gave me inspiration to try to make my one silicon glued aquarium in June 1973. I had got information in Oslo how to do this, and was followed what the advisor told me. I was placing the aquarium in the basement room with outlet and was filling it with water. I was very unsafe and was thinking maybe it will break down and all the water out on the floor. All went well and after this time I silicon glued all my aquariums, how many I don’t know maybe some hundredths. 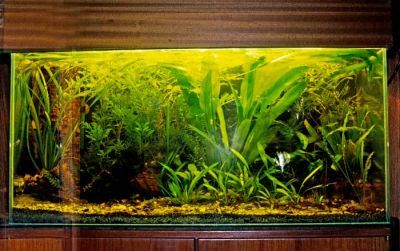 After some time i was selling this aquarium and more the 20 years later I was seeing it again and the new owner told me that it have never been problem with the aquarium. Today, there have been 35157 visitors (90888 hits) on this page!